TUCK AND HIDE BARSTOOL UNDER COUNTER TOP - With a straight leg design that doesn't extend past the padded studded seat, these counter height stools can be properly stored under your counters when you're not using them. STAY COMFORTABLE SITTING FOR HOURS - With a 4.3" thick gray cushion seat your backside won't go numb. 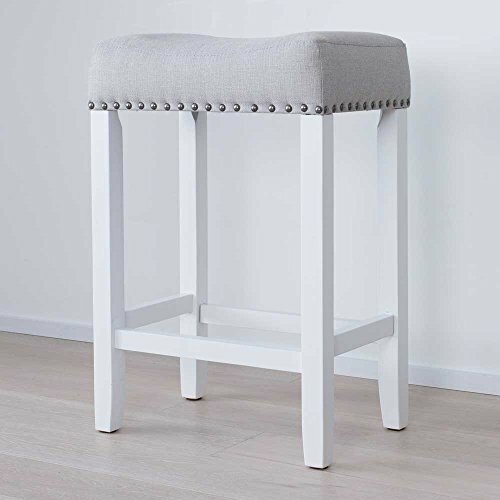 This saddle stool is great for all heights, with two foot-rest options for your legs, you'll be comfy whether you're tall, average or fun sized. Designed for comfort and durability with design in mind. The gunmetal nail heads on the fabric seat will add timeless style to your beautiful kitchen, since as we all know...the kitchen is the heart of every home. NO SCRATCHED FLOORS ON OUR WATCH - We have added 4 floor protectors on the bottom of each barstool legs. There are few things in this world we can control and this one was a no brainer. Use these stools for your kitchen island, breakfast nook, pub or bar table. EASY 15-MINUTE ASSEMBLY - Our simple to assemble design is made to ensure that anybody can put this modern bar stool together. No furniture building experience is required. By following our simple instructions you can order your pizza and before it arrives, you'll have your barstools up and ready to use. STURDY and BUILT TO LAST - Using high grade durable materials and a solid wood base, you'll be sure this barstool is built to last. The sturdy wooden construction of this bar stool can hold up to 250-lbs. We at Nathan Home stand behind our products, but just to make sure, you have 90 days to try it out. If you don't love it, just return it. Our 5 year warranty also applies to keep you protected in the long run just in case of any defects. If you have any questions about this product by Nathan James, contact us by completing and submitting the form below. If you are looking for a specif part number, please include it with your message.